the “East African” category on 23andme or more properly said the “Northeast African” category probably peaks among Somali. Most of my 7 Somali examples being nearly 100% “East African”. Interestingly the last two being exceptions. Most likely because of some additional minor ancestry from the Middle East and South Asia dating from within the last 500 years. The “West African” is still minimal or even absent. This peaking of the “East African” category among Somali is likely caused by “overfitting” or a “calculator effect” because 12 Somali customers from the 23andme database were used as samples (see screenshot above). Otherwise it is Ethiopians who seem to score most consistently for “East Africa”, they were also among the samples being used. However unlike the 7 Somali results they are also shown as having a significant “North African” component. This should not be taken as suggestive of recent ancestry from that area but rather indicative of their DNA markers in part being similar to the ones for the samples being used to define the North African category. The most notable difference between the South Sudanese sample and the northern Sudanese is precisely this socalled “North African” component. Besides also a different degree of “West African”. Their “East African” percentages seem to be in a similar range. All the Ethiopians, the Eritrean and also the Somali hardly show any “West African” % beyond trace level. This seems to be a robust sign of mutual exclusivity implying that the “East Africa” category seems to be very predictive of specifically Northeast African ancestral origins or affinity because there’s no overlap with the “West African” category. Most of the other East African examples below however do show a significant “West African” component. Again this should not be taken as recent ancestry from that area but rather indicative of their DNA markers in part being similar to the ones for the samples being used to define the “West African” category, i.e. “Niger-Congo-like”. As discussed on the previous page Kenyan Bantu samples were used among others to define the “West African” category so it’s not that surprising that this similarity is showing up. Among Rwandans and Kenyans there are some high outliers, higher even than the Ethiopian ones! The ones for Rwanda approaching the Somali results of over 90%. But there’s also some lower “East African” percentages for especially the Kenyans, suggesting a greater variation according to ethnic background. Tanzanians also show considerable scores, with the Sudan and Ugandan results somewhere in between. I have some results from Mozambique and Zimbabwe as well and they show either zero or very miniscule “East African” %’s of below 1%. For two Madagascar results it’s also very minor but still at detectable level of in between 1-3% (see “Central & South Africa” for their screenshots). Indicative of this ancestral cluster rapidly decreasing when going south. Again much of the variation will also be depending on ethnic background and deep ancestry aside from just nationality or geography. Nilotic speaking groups (like the Maasai samples) or Cushitic speaking groups (like the Somali) being more likely to score highest for “East Africa”. This might actually also include a few ethnic groups who might have undergone a language shift and are now speaking a Bantu or Afro-Asiatic (Amhara etc.) language instead. Or Bantu/Afro- Asiatic speaking etnicities who absorbed formerly Nilotic/Cushtic speakers within their ranks through intermarriage. It is often underestimated IMO how ancient & complex histories of ethnogenesis are still able to impact on admixture tests that are supposedly in 23andme’s case looking back only “500 years”. Outside of East Africa proper from what i’ve personally observed this category only seems to appear among selected ethnicities, i.e. South African Coloureds and West African Fula, or West Africans with likely partial Fula ancestry (posted near bottom of page). For one individual of confirmed Fula background “East African” reaches almost 20%! For the others it’s much more reduced but still detectable. It’s important to note that this doesn’t imply any recent ancestral connections with Northeast Africa, it’s rather pointing towards genetical similarity/affinity and possibly very ancient shared ancestry with presentday Northeast Africans but not per se originating from that area. 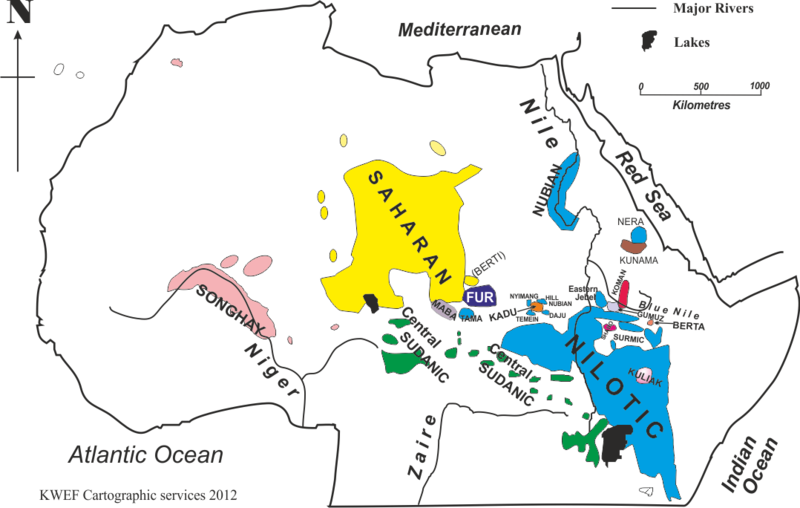 It might be testament to very ancient Nilo-Saharan connections across the interior of West to East Africa, obscured nowadays because of language shift and ethnogenesis. Specifically for the South African Coloured results it might be an intriguing testimony of an ancient link between the Khoisan and Northeast Africa, see also this paper from 2012, and this one from 2014. Among the hundreds results i’ve personally seen for Afro-descended individuals (both among my sharing list and also posted on various online forums) practically all score “East African” below trace level of 1%. The highest score i have seen myself being 1,6%, which is also the only one above 1% (see screenshots below). For most Afro-Diasporans it seems “East African” is simply inexistent and only for a few it’s in between 0,5%-1%. Obviously this would represent a very minor part of their overall African origins but it can still provide a valuable indication in some cases for identifying 1 single African ancestor. This outcome being in line with documented slave trade to the Americas not involving Northeast Africa but reaching its outer limit in Southeast Africa or Mozambique. So in that sense it could be seen as a confirmation for Afro-Diasporans generally not having any Northeast African origins. Of course individual exceptions should not be ruled out at this preliminary stage but the odds seem to be very small indeed. A small % of “East African” is more likely to be indicative of ethnic West African roots instead for most Afro-diasporeans. The very dilluted “East African” ancestral component being inherited from specifically the Fula who are the only West Africans i’ve personally seen to score minor yet very detectable levels of “East African”. Scenario’s involving other ethnicities from Southeast Africa also still being possible though. A notable exception however being Afro-descendants located in the Middle East and the Indian Ocean islands. 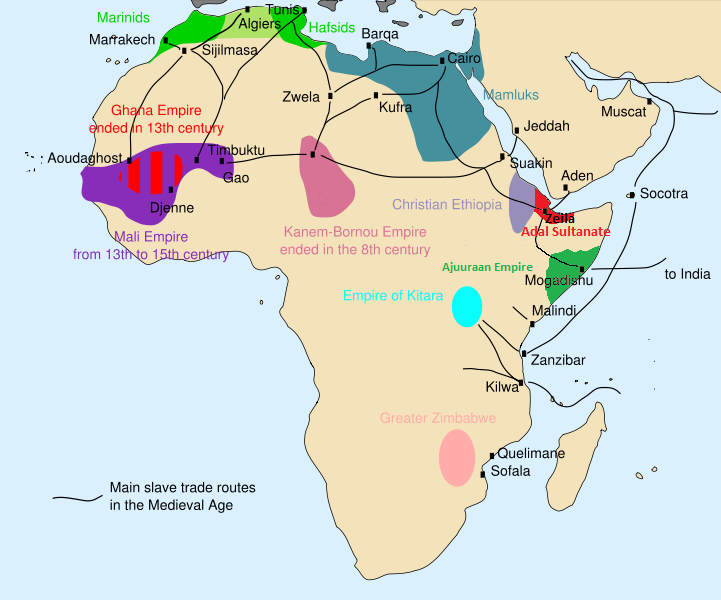 Unlike the Trans Atlantic Afro-diasporans, these people often will have substantial East African origins resulting from the socalled Indian Ocean slave trade and/or the Trans Saharan slave trade carried out mostly by Muslims. 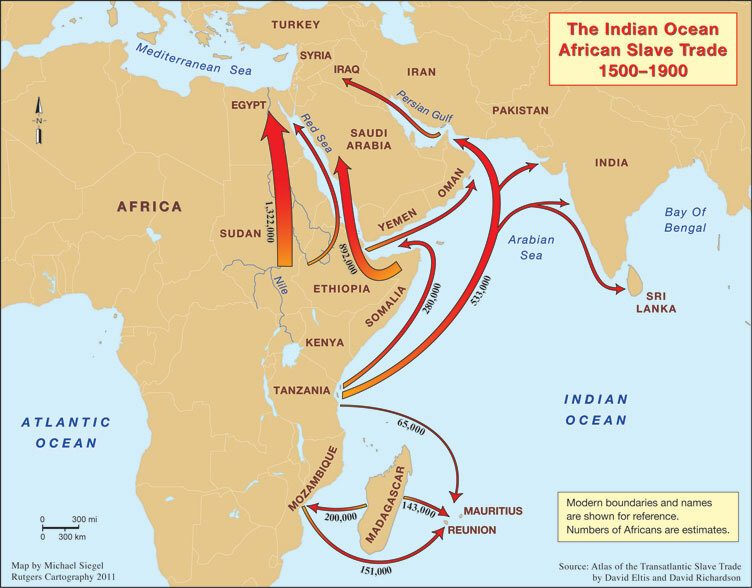 This slave trading circuit was largely separate from the Trans Atlantic one and is known to also have targeted areas within Northeast Africa. The two very last screenshots posted below are testament to that legacy, showing “East African” admixture levels which seem to be very distinct and elevated compared with Trans Atlantic Afro-diasporeans. Making this a recognizable “tell tale” marker in a way to distinguish both groups of Afro-diasporeans. Much of their socalled “West African” component might actually also hail from Bantu speaking areas within East Africa. Hopefully a future update will bring more clarity. “1) 23andme’s East African is not always consistent with the reference group’s definition, at least if one assumes that the reference group is weighted. I don’t understand how Somalis are nearly 100% East African when the reference group is dominated by Massai. If they are taking a simple group average between Massai + Horners, I would understand, but a weighted average would put the Somali’s at less than 100%. 1) Good point, my guess would be that it’s partially to do with a remnant “overfitting” or “calculator” effect, caused by Somali samples being used from 23andme’s own client database. Another thing possibly contributing to this outcome could be a difference in the way the Maasai samples have been genotyped by Hapmap3, most likely capturing a lower number of SNP’s or else a less custommade set of SNP’s compared to 23andme’s own method of genotyping. The Somali samples from 23andme also likely to be much more recent; Hapmap3 samples dating from 2009 if i’m not mistaken. 2) Very true! I had not bothered yet to check their PCA position (ANCESTRY TOOLS > GLOBAL SIMILARITY MAP) but you’re correct the few Rwandan people and the 1 Somali i’m sharing profiles with are clearly clustering apart from each other. I was also a bit surprised by the 90%+ EA scores of the 2 Rwandans (most likely of Tutsi background) and how closely they approached the one single Somali result. Perhaps 23andme is moreso picking up on Maasai similarity for them compared with Somali’s whose results also reflect their similarity to the Somali samples used by 23andme. I did notice however that the Rwandans still show some minor but detectable “West African” (3.6%-4.4%) , while the Somali and all the Horners only seem to have it at noise level. I remember from Tishkoff (2009) there were a few mixed Tutsi/Hutu samples but they only scored less than 20% “Cushitic” in that particular study. Also Razib Khan once genotyped a Rwandan person, supposedly 3/4 Tutsi and 1/4 Hutu. (http://blogs.discovermagazine.com/gnxp/2011/08/tutsi-differ-genetically-from-the-hutu/#.VQRn4o6G9GY). It’s quite interesting because in the figure of his K=7 ADMIXTURE run you can see how the Tutsi individual compares with some Somali and also Maasai. Thanks for commenting! Judging from these 23andme results it seems they do share a great amount of similar DNA. If they indeed also share a set of common ancestors it would be very interesting to know how long back in (pre) history you would have to trace back approximately to find them. This page has offered very useful information. My sister went through DNA mapping using 23andme. When it got to step 5 and started churning out raw data I took the information and dumped it on Gedmatch. I was surprised to find on average about 5% of East African ancestry. This showed up consistently in the various databases on Gedmatch. However, now that the Ancestry Composition is complete on 23andme it only shows primarily West African ancestry and not a trace of East African ancestry. Why is there a discrepancy? Thanks for your comment Andie! I’m intending to create a separate page on Gedmatch results shortly where i will go into greater detail. It’s perhaps telling already to know that West Africans themselves on Gedmatch also receive these minor East African scores and are not shown as “100% West African” even when all their known ancestors are in fact West African. It most likely reflects very ancient migrations across the continent. Similar to the way some haplogroups are widespread across various African regions and date back from sometimes tens of thousands years ago. You probably inherited these genes by way of West/Central African ancestors who already carried these markers in their own DNA. If it had been more recent 23andme would also have picked up on it. That is in case we’re talking about Northeast African/Nilotic ancestry. East African Bantu ancestry is trickier because of the way 23andme designed their referencepanel (using Bantu samples for their “West African” category). Basically it’s a question of which timeframe you’re using when taking your ancestry into consideration. The Ancestry Composition by 23andme was designed specifically to “reflect where your ancestors lived before the widespread migrations of the past few hundred years.“. While the various admixture calculators on Gedmatch seem to focus more on socalled deep ancestry which goes back not just centuries but even many millennia in some cases. In fact despite their statement sometimes 23andme’s results still also seem to suggest ancient ancestral connections but generally they would be more informative of your ancestry within the last 500 years or so and the Gedmatch calculators could reflect ancient migrations from more than 5000 years ago. If you’re wishing to know where your African ancestors who survived the Middle Passage hail from, i’d say the timeframe used by 23andme is the most appropriate one. Do you have the Gedmatch results of any of the other East Africans featured in this post, but especially the Rwandans. Ps. I am the 3rd Rwandan listed, and just to clarify, I am 3/4th Tutsi and 1/4th Hutu. I recently got my Gedmatch results back and I would describe my genetic ancestry as 55% South Cushitic, 40% Bantu, and 5% East African hunter-gatherer (so something similar to the Hadze and Sandawe). Tutsis are therefore probably 65% South Cushitic, 30% Bantu, and 5% h&g, in comparison to Hutus at approximately ~80-85% Bantu. Thanks a lot for clarifying your background and sharing those results! I intend to create a separate page with gedmatch results of Africans from various parts shortly. I’m Somali and I got 48% east Africa 41% middle east 7% north Africa. This was on Ancestry. I am awaiting my 23andme results. I don’t think all Somali people have close to 100% Africa DNA. Your AncestryDNA results fall right in line with what i have seen sofar for 8 other Somali. Their socalled “Southeastern Bantu” region is of course mislabeled for Northeast Africans because unlike 23andme they lack reference populations from the Horn or Nilotic speakers. It’s a next-best outcome if you like. Ancestry’s analysis can still be informative though as long as you keep in mind this limitation and realize that an older timeframe is being suggested when they describe your origins. Probably going back thousands of years rather than centuries. This will be different on 23andme as they make an attempt to describe your ancestry within the last 500 years or so. Eventhough they don’t always succeed in this effort. See for example the results of Ethiopians and Kenyans. However for Somali 23andme does seem to deliver a reasonable job as strictly speaking within the last 500 years most Somali would indeed have exclusive origins from Northeast Africa safe for individuals who might still show minor recent admixture, mostly among coastal/trading communities i imagine (e.g. see results for Somali 7). I don’t get…..what is East African? Is it a race like west Africans? Is Nilotics, Cushitic or some unknown race? This vague? I would like to know what East African is. Well it’s context dependent… Of course it is firstmost a geographical term. For genetic purposes i find personally that there’s more added value in distinguishing between Southeast Africa and Northeast Africa. In this way genetic affinity with Bantuspeaking populations can be separated from genetic affinity with Nilotic/Cushitic speaking populations. However most DNA testing companies tend to be a bit sloppy in this regard. It’s always advisable therefore to thoroughly inspect which reference populations are used for any self termed “East African” category. When it comes to 23andme just read closely what i wrote in the beginning of this page as well as this page. I got my results from ancestry dna. I am African American and I got 12% southeastern bantu and 10% east african on gedmatch. I was looking to find info as I thought I would only have west african. Hi Khadijah, many AA’s have this question when they receive their results. If you carefully read this page as well as the commment section you will learn that the socalled “East African” label when used in DNA testing should always be critically scrutinized. When it comes to Gedmatch i am usually very sceptical about the socalled East African scores reported for African Americans and other Afro-Diasporans from the Americas. You have to keep in mind that actual West Africans also receive such scores and are not described as 100% “West African”. If not some fluke or misreading it most likely represents VERY ancient population migrations across the continent (going back millennia instead of centuries). Irrelevant from a genealogical perspective (last 500 years or so). When it comes to your “Southeastern Bantu” score on AncestryDNA , this component could actually (and most likely) have been inherited from Bantu speaking ancestors from Southwest Africa, in particular Angola but also surrounding countries. Northeast African origins are described by AncestryDNA as a combination of Southeast Bantu *and* North Africa *and* Middle East. If your results don’t show those last two components above trace level you can be almost positive you don’t have any recent or substantial connection with Northeast Africa. And instead it will be indeed Bantu speaking origins from Southern or rather Central Africa. As is also in line with plentiful historical documentation and cultural retention. I am Somali according to 23andme I have 97.6% SSA, 97.3% east African, 0,3% broadly sub-Saharan, 1.6% MNa North African. paternally hablogroup T, mtdna M1a1, why do I have high percentage of SSA, if my ancestry hablogroups T and mtdna M1 are not native to Africa? Thanks for your comment Ali! Firstly you have to keep in mind that the actual DNA contribution from your haplogroups will always be minor (<1% if i 'm not mistaken). This is because the first persons carrying your haplogroups usually lived thousands of years ago. Sometimes haplogroups can indeed be indicative and corresponding with predominant ancestral lineage but not per se so. For example i know several African Americans who have non-African haplogroups (both maternal & paternal) yet are predom. African in their autosomal genetics. Secondly your socalled SSA % on 23andme is inclusive of Northeast African origins. This is because 23andme aims at describing your ancestry in a genealogically meaningful timeframe (within the last 500 years or so). However other DNA testing companies, such as Ancestry.com, as well as Gedmatch will typically describe the DNA make-up of Somali and other Northeast Africans with much lower SSA proportions. This is because they are also taking into account (very) ancient geneflow from West-Eurasia into Africa. Hello, recently acquired AncestryDNA results from my mom’s side: 44% south eastern bantu; 13%North Africa and 37%West asia. I believed I was about 90% East African. I’m a bit distraught. I know Somalia is close to West Asia, however I have seen Somali results with almost 100% East African. Does this mean some Somalis refused to mix..or they were left alone….and some came into contact with West Asians? GEDMATCH provided me with Natufian admixture of about 35%, so is the heritage from West asia pretty ancient and not recent? Basically I have been bragging to many people I am pure SSA African and now this DNA has made me question myself LOL. Disclosure-Both Parents are from Ogaden region and GEDMATCH provided large chunk of ‘Omotic DNA,” maybe that affected my results. This is a very common reaction when Somali or other East Africans receive their results. My short answer would be it’s all relative; ethnic identity is dependent on whichever perspective you take: cultural, historical, linguistic etc. Outsider influences are inevitable as no modernday human population has ever lived in complete isolation of neighbouring ones for an indefinite period. When it comes to genetics especially the timeframing is essential. Are you measuring admixture from only a few generations ago or rather from many thousands years ago when the Somali identity might not even have existed yet? You did your DNA test with AncestryDNA but this page features testresults from 23andme which is not directly comparable. You have to keep in mind that each different DNA testing company will provide you with a different description of your ancestral origins. Because each company uses a different database of reference populations to compare your own DNA with, plus they may also apply different algorithms when calculating their estimates. Also the implied timeframe will be different. On AncestryDNA it is indeed pretty ancient admixture which is being reflected in your results, often thousands of years ago. 23andme on the other hand attempts to describe your ancestry within the last 500 years or so. The 90%-100% East African scores you have seen were from people who tested on 23andme, if you were to test with this company undoubtedly you will obtain a similar result. As described on this page 23andme uses East African samples, incl. Somali, in order to calculate their results. On AncestryDNA however they only have Kenyan samples which together with samples from Namibia and South Africa make up their socalled “Southeastern Bantu” region. Not to be taken literally of course because any score for this region only measures genetic *similarity* to these samples rather than actual descent! When it comes to your AncestryDNA results they fall right in line with what i have seen sofar for 20 other Somali. The group average for SE Bantu being 43,8%, Africa North 11,1% and Middle East 37,7%. So nothing out of the ordinary for you 🙂 Ancestry’s socalled “Southeastern Bantu” region is of course mislabeled for Northeast Africans because unlike 23andme they lack reference populations from the Horn or Nilotic speakers. It’s a next-best outcome if you like. Unless you have family traditions suggesting otherwise practically the entire socalled Middle East amount will in all likelyhood be an ancient ancestral component which has been present in the Somali genepool right from the start. I imagine if you did indeed happen to have let’s say 1 Saudi grandparent this would show up in your results as a clearly more pronounced Middle East score than the group average of 37,7%. Also your closest DNA matches would probably already be indicative, even if there are not that many West Asians yet in Ancestry’s customer database. Ancestry’s analysis can still be informative as long as you keep in mind these limitations and realize that an older timeframe is being suggested when they describe your origins. Probably going back thousands of years rather than centuries. Again it is all about whichever perspective you want to prefer. Also this video might be helpful. Hey…something that would be dope if you could get back to me, considering I think I have both Luyha and Luo ancestry (Im an east african coloured) but haven’t done a test yet. Why did the Luo individual above score 98% West African, when Luos are Nilotic people..surely they would genetically have most similarity with 23andme’s Maasai sample? 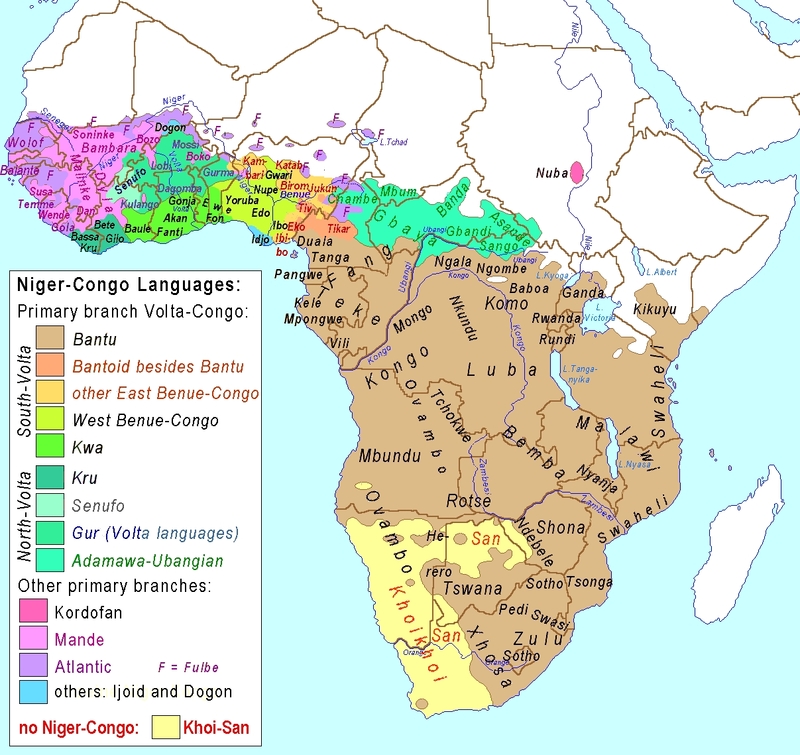 And in regards to Luyhas…even though they are a Bantu speaking people presently, do geneticists consider them more Niger-Congo as in typically West African peoples? Thank you. Interesting background! The important thing to keep in mind when interpreting these 23andme results is which samples have been used to define either “East Africa” or “West Africa”. Below is an overview of the samples which 23andme currently uses for their West Africa category. You can see that Luhya samples are being included, which means that 23andme will read this part of your DNA as “West African”, which is of course totally mislabeled. But apparently 23andme felt the need to keep their “East Africa” category more so Northeast African (Cushitic/Nilotic) orientated. In case you’re considering which test to take i would say AncestryDNA will do a better job at describing your Kenyan DNA at this moment. Despite a similar case of potentially misleading labeling their socalled “Southeastern Bantu” and “Cameroon/Congo” regions are much better equipped to separate East African Bantu ancestry from West African ancestry. Obviously you might also want to keep other things in mind when deciding on which test to take (haplogroup testing, DNA matches , health reports etc.). See this page for East African AncestryDNA results. I am from Burundi. Both My parents are half-burundian and half-rwandan. Broadly speaking I would be considered Tutsi. In more details I am ganwa (Princely line) on my father’s male line and my mother’s paternal grandmother’side but Tutsi on all my female lines. On Ancestry I got 72% Southeastern Bantu, 2.5 East Asia, 8% North African and 18% Middle Eastern. How do I know how much West-african I have? DNA Land says I am 86%East-african, 2.5 Arab, 7%North African. What is really “East-african? Gamble’s cave? Nyoro river cave? Elmenteitan? Kenya Capsian? Eburran industry? I believe I look very Maasai! On Gedmatch I also score highly with Sandawe, Maasai, Somali,Luo, luhya,and Ethiopians(Including Wolayta, and Ari) samples. Thanks for your comment GR. Also much appreciated that you shared your very interesting results! As explained in an earlier comment you have to always look very careful how “West African ” or “East African” is being defined in DNA testing. This will be largely dependent on which sample groups are being used. But at any rate these concepts will usually tend be most concrete as purely geographic terms. Because of ancient migrations across the continent, languageshift, mixing of populations etc. it is much more complex to arrive at clearcut genetic definitions. It will always be context dependent and also your perspective on relevant timeframing will matter (relatively recent, and still genealogically meaningful, let’s say within the last 500 years or going back much further in time into ancient prehistory). As it is right now 23andme is including East African Niger-Congo speakers from Kenya in their “West African” category while their “East Africa” category is based on Horner samples as well as Maasai. However on AncestryDNA it’s different because they have no less than 5 distinctive West African regions as well as two separate regions for detecting Bantu speaking origins: “Cameroon/Congo” and socalled “Southeastern Bantu”. Due to a lack of Nilotic and/or Cushtic samples actually this last region is of course mislabeled for Northeast Africans as it will act as a proxy for these type of origins. This also goes for the Tutsi but perhaps to a lesser degree. However things will be different when your DNA is compared against other datasets, possibly you will then get more insight about much more ancient admixture. Which can also be interesting but is more so reflective of population genetics of the Tutsi as a whole rather than touching on your personal family history per se. I cannot tell you which calculators will give you the best result. But as you may already know the Ethiohelix and puntDNAL calculators were designed especially with East African genetic diversity in mind. Thank you so much for what you do for us. I really appreciate. So, As an educated guess, roughly, what do you make of this so called “South Eastern Bantu”? Myself, Kenyans, Somalis and Ethiopians seem to peak amongst others yet Congolese few miles across our border have traces and I have zero Cameroon/Congo. Does this mean tutsis actually mixed very little with hutus’? I wonder how Maasai score on it? Is it some type of extinct or archaic proto-nilotic or proto-cushitic? That middle-Eastern could be natufian not recent just like the african DNA link above shows. I feel like I am not wrong with those sites I mentioned, holding my ancestors fossils. If you are interested in East-african and african art& history check out my FB pages: “Tuvuge INKA” “ABAHINZA”, AFRINKED, TUJE MU BATWA. Basically i believe for a correct interpretation of socalled “Southeastern Bantu” you will need to find the appropriate context. Various speculative ancestral scenarios might apply. However what might be a plausible explanation for Northeast Africans will be entirely different for other parts of Africa and especially for Afro-Diasporans. I think it’s best to to just take it back to the (most likely) samples which are being used by AncestryDNA to determine your socalled “Southeastern Bantu” as well as socalled “Cameroon/Congo” amounts. According to their white paper Ancestry makes use of the HGDP database. They don’t give any further specifics but it seems very reasonable to assume that for socalled “Southeast Bantu” samples from not only Kenya but also South Africa and Namibia are being used. While for “Cameroon/Congo” it’s probably Bakongo samples from Congo Brazzaville as well as Bamoun and Bamileke samples from Cameroon. So all these samples would be from Bantu (or Bantoid) speaking populations but from across a very large area in Africa and quite likely also reflecting absorbed influences from other populations, incl. Nilotic for the Kenyan samples. It is intriguing indeed that (based on merely two Burundi/Ruanda samples though) you as a Tutsi do not show any “Cameroon/Congo” but only “Southeastern Bantu”. This is something i have also observed for all Somali/Ethiopians/Eritreans in my survey as well as two Ugandans, one Tanzanian and most of my Kenyan (Kikuyu) samples sofar. Perhaps tellingly one Swahili Kenyan however did show a considerable amount of “Cameroon/Congo”. I do not think at ths stage you can conclude anything about possible Hutu-Tutsi intermarriage patterns. However it does say something about the genetic similarity of your DNA when compared with either Congolese/Cameroonian samples versus Kenyan (Bantu speaking!) samples. I did a 23andme test and got 70% East-african, 20% west-african. I have a feeling that the west-african is a mixture of kikuyus and nilotes. Bcz on my heritage I scored quite high on the Maasai sample 39%! Interesting conversation going on here. Thanks @FonteFelipe for your research. I am from the Burundi/Rwanda region as well Tutsi background as far as my family can remember. Though, patriarchal societies tend to dismiss/forget easily the maternal lineages if one goes far enough. Don’t really want to call it ethnic group or race because it is neither. So DNA Test results from 23andMe showed 68.8% East African,22.3% West African, 1.3% Central&South A, 0.4% North A. with 6.8% Broad SSA (What?? ?me not like), 1.4%Unassigned. When I uploaded my raw DNA data on Gedmatch, the result showed ~30% Nilo Saharan, 26.6%East A.2, 17.83% West A, 9.83%East .A1, 8.17% Omotic, 4.5%Mbuti, North. A. 2.91%. For single population approximations, I was closest to Masai, Eth. Oromo and Hema peoples. I was surprised with the amount “Nilo-Saharan” that I scored, never thought it would be that high. In my opinion, Gedmatch has better data set for East African people, though they are missing the “Niger-Congo” or “Cam-Congo” to separate the actual “West African”marker from “Bantu-congo”. Would be interesting to see. I do think the West African marker on 23andMe absorbed some Nilotic of mine. Let me know what you think @FonteFelipe. Are there any populations that score 100% Nilo-Saharan, 100%East Africa2 and 100%East Africa1 in your opinion? I am curious to know who the base populations are for those markers. Thanks for your comment Munyankara! Such discrepancies between various DNA test results are indeed a common theme. I do not know if there are any populations who score 100% for the categories you mentioned. However usually if you check the home page of the creator of whichever GED-match calculator you have been using you can get a very useful link to spreadsheet which features the admixture results for the reference populations themselves. Hey @Fontefelipe I found out that the high East african for Rwandans was before the many updates. With the new updates, no rwandan/burundian scores that high anymore due to many more reference populations they added. I believe those kits of Rwandans you showed were old and didn’t get updated. If they tried Gedmatch calculators, it would prove my point. From the individuals I have seen on 23andme with the most recent update, looks like people of Tutsi background average 50% North East Africa (Varying between Ethiopia-Eritrea & Sudan), +/-50% Southeast Africa (Great Lift valley Bantu) and more or less little to no Congolese-Nigerian-west african-senegambian (traces at most). The other interesting thing are the paternal and maternal haplogroups. Again just the data I have seen which is small sample showed more east african mtdna than y-dna. Most notable East african y-dnas were E1b1b (E-M293 mutation subclade of E-M215) and A3b2 (A1b1-m118), E2 (E-M75&E-M54-not common) and the rest were West/Central af subclades of E1b1a (subclades of E-M180). In the sample I saw of 17 individuals we had about 50/50 east-west. The mtdna are definitely more East af in majority (L0f,L3h…), don’t know what one should read out of this. I thought would be good to share this. I’m Kenyan form the Coast city of Mombasa. To my knowledge I’m mostly African however my Great Great grandfather was Persian which explains the 3.8% admixture. I did an dna test on myheritage.com. I’m 80,5% somali, 9,1% north african, 5,2% middle eastern, 4,2% nigerian and 1% west african. I did not expect such an high west african result. My parents do not recall having west african ancesters. How many years back is 5% traceble? Hello Sucaad, I have no personal experience with MyHeritage. But based on what i have seen reported for other people as well as their particular selection of reference populations I do not have a high opinion of it. Depending on which time frame you want to focus on i believe that firstly 23andme but also Ancestry do a better job at describing Somali DNA. As i mention continuously on this blog the labeling of ancestral categories in admixture testing is not to be taken too literally. Instead you should just take them as proxies and be aware of how other people of your background score for these categories. When you get down to it, any of the regional scores you receive basically tell you to which degree your own DNA is similar (according to an algoritm) to the various samples within a given referencepanel or database of the DNA test. That 5% socalled West African score is not per se to be traced back to actual West African ancestors. In the absence of any corroborating evidence i would simply take it as an artefact of the way MyHeritage performs their analysis. I am from Rwanda. I found you’re research and comments very informative! Especially the rwandans results. However you should know that the river Nile ends (or starts!) in Rwanda, and the common belief is that our ancestors travelled south following the Nile (maybe looking for the source? ), and settled in the fertile highlands of Rwanda. But we don’t know exactly how far north we come from, so I think it would be nice if more Rwandans do the test. I am often mistaken to being either Somali, Eritrean, or North Sudanese so I think there might be truth in that theory. I would also like to note that the terms ‘hutu’ and ‘tutsi’ are a colonial heritage. There is actually a high diversity among the ‘Tutsis’ with 20 different clans, so you could say its not a homogenic group. I am myself from the Abega clan. As Rwandan I found it hard to choose which test I should do, especially because the term ‘eastafrican’ or ‘southeastern bantu’ is vague. I chose to do the myheritage test because they have specifically Masai, somali, ethiopian jewish samples, and I find it interesting to find out how much Im related to those populations. While I’m waiting for my results, I would like to ask you which other test you would recommend me? Hello Umwega, thanks a lot for your message! I would love to hear about your MyHeritage test results, once you have received them. Personally I have only tested with 23andme and Ancestry.com. It’s hard to pick which test to recommend because each one has their one strengths and weaknesses. It’s really about what kind of insight you are seeking to obtain. Also how important would it be for you to connect with any DNA matches? Given their greater customer database, you are probably most likely to get a higher number of DNA matches on Ancestry. But with 23andme you receive as an extra bonus the haplogroup assignment which is not available on Ancestry. Comparing the admixture analysis on both platforms, it’s crucial to know how other Rwandans as well as East Africans tend to score. Given your Tutsi background it’s very likely that 23andme will describe your ancestry as overwhelmingly “East African”. In case you should score below the 80-90% range it *might* possibly indicate some minor Hutu lineage I suppose. This is however based on the very few Ruandan results I have seen sofar. With AncestryDNA it seems a more ancient timeframe will be implied. As the few Tutsi results I have seen sofar all score minor but still very much detectable amounts of so-called “Middle East” and “Africa North”. The labeling of these categories is in fact not to be taken too literally. Also you should not mistakenly assume you have any recent non-Tutsi lineage based on those results. In fact all Northeast Africans tend to receive these regional scores. Most likely to be explained by very ancient West-Eurasian migrations into the Horn of Africa thousands of years ago, and subsequent southward migrations of their (mixed?) descendants. If you are aware of this wider context it should be easier to make correct interpretations. The so-called “Southeastern Bantu” region then also becomes more informative, especially when contrasted with any “Cameroon/Congo” reporting. This latter region being much more typical for Hutu’s, based on what I have seen sofar. See also this previous comment. Hi. I finally got my results from myheritage DNA. First I need to clear up that I’m Tutsi but not ‘pure’. My grandmother from my father’s side was hutu, as my mom’s grandmother (her father’s side). That would make me around 70% Tutsi. Thanks a lot for sharing your results Umwega! Was there any further detailed breakdown of the East African score? Interesting expository essay I am a Luo from Kenya & would love to add or clear up on any query about the Kenyan 6(Luo) having a substantially high West African DNA. Thanks a lot for your insightful comment! I have no further details on that particular Luo sample, but the Abasuba scenario you mention seems plausible indeed! Great to hear that you are also considering taking a DNA test. Hello i am from Ethiopia and i did my DNA test with My Heritage. I got Ethiopia Jewish 39.5%, Somali 17.5%, Maasai 14.9%, Sephardic Jewish-North African 13.4%, Nigerian 1.5%, Middle Eastern 11.2% and East Asia 2.0%. I was a little confused because i didn’t know if there was a different between regular Ethiopian DNA and Ethiopian Jewish DNA. Also i thought Sephardic Jewish was European. But i have no European. How can this been. Can you please help me. I have no personal experience with MyHeritage. But based on what i have seen reported for other people as well as their particular selection of reference populations I do not have a high opinion of it. Depending on which time frame you want to focus on I believe that firstly 23andme (more so focus on recent lineage ) but also Ancestry (more so focus on ancient lineage) do a better job at describing Ethiopian DNA. As I mention continuously on this blog the labeling of ancestral categories in admixture testing is not to be taken too literally. Instead you should just take them as proxies and be aware of how other people of your background score for these categories. When you get down to it, any of the regional scores you receive basically tell you to which degree your own DNA is similar (according to an algorithm) to the various samples within a given reference panel or database of the DNA test.